Relax and enjoy sky-high living in this breathtaking penthouse, boasting incredible views from Barcelona’s famous Avenida Diagonal. Eclecticism resonates throughout the penthouse with carefully selected pieces such as the elegant coat hooks made from Legna wood and bronze by Chilean design studio Bravo and the contemporary olive green Corniche-for Vitra shelves that give an accent of color to the clean white walls. 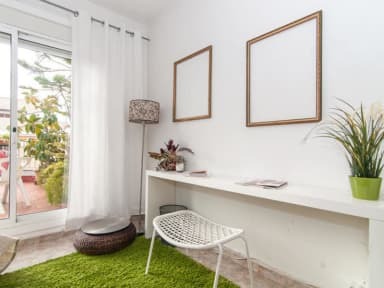 Set a 10-minute walk from Plaça Catalunya, 900 m from Casa Batllo and 1 km from Tivoli Theatre, Apartment Casanova-Diputación offers accommodation situated in Barcelona. 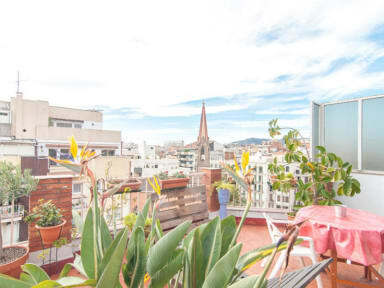 The property is 1.1 km from Portal de l'Angel.